This 45-minute lesson briefly introduces learners to the benefits of using probabilistic forecast information to assess the weather and communicate forecast uncertainties. 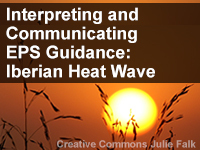 Learners will explore a heat wave event in Spain and practice interpreting EPS forecast products effectively to determine various forecast parameters based on lead-time. Also, learners will decide how to best communicate the potential weather threats and impacts information to local end users. Good overview of EPS guidance using the Iberian Heat Wave as a case study. Great lesson, excelent for fix the concepts on the subject. Great idea, great use of data . . . but where do we go to get it.